Synopsis: Before she was adopted by a loving family and raised in a leafy Home Counties town, Cass Montgomery was Cass Jones. Her memories of her birth family disappeared with her name. But when her adopted family starts to break down, a way out comes in the form of a message from her lost brother, Aidan. Having Aidan back in her life is both everything she needs and nothing she expected. Who is this boy who calls himself her brother? And why is he so haunted?Aidan's a survivor. He's survived an abusive stepfather and an uncaring mother. He's survived crowded foster homes and empty bedsits.He's survived to find Cass. If only he can make her understand what it means to be part of his family. . . 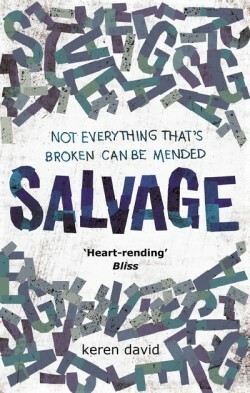 I don’t have much to say about Salvage; in many ways, Keren Davies’ novel is very much self-explanatory as a contemporary bildungsroman that explores the tensions of adoption, both for the parents and the children, and the never-ending nature vs nurture debate. Salvage is told from the alternating perspectives of Aidan and Cass, two siblings who were split up during the adoption process. Twelve years later of rocky family life with a variety of foster parents, Aidan is now a self-sufficient eighteen-year old living with his older girlfriend and her son, Finn. He’s got a job, too, working for a local a salvage reseller. Aidan wants to give Finn the homelife he never had, and the father he always wishes he did have. Cass, meanwhile, has spent 12 happy years with her adopted parents, being nurtured and looked after. As the novel ratchets up to its final climax – a teary one, I can tell you – all you want to do is shake the characters and tell them to communicate with each other; to stop keeping secrets, putting on brave faces or ignoring their hurts and pains. Indeed, this seems to be the raison d’etre of the story, as Davies finishes poignantly with a hopeful little chapter that doesn’t wrap it up neatly but gives a sense of a better future. 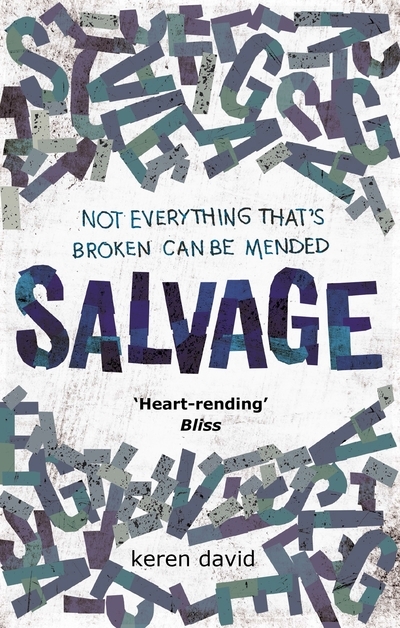 More than anything, Salvage will make you realise just how much you appreciate how much you love those close to you, and, perhaps, how lucky you are to not be in all the situations that both Cass and Aidan are in.